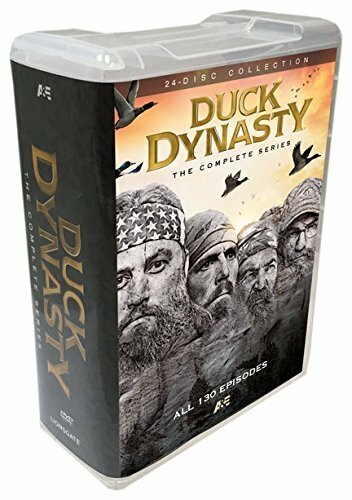 For the first time ever, all 131 episodes of the beloved A&E® series, DUCK DYNASTY®, are collected in this mammoth 24-disc set. Grow a beard and grab the camo - here's the ultimate collectible for DUCK DYNASTY® fans! For eleven seasons, millions of TV viewers tuned in for the colorful adventures and homegrown humor of the Robertsons, the backwoods family that built an empire out of a small duck-call business. Now you can enjoy all 131 episodes - with such unforgettable moments as Willie and Si's woodchipper competition, Sadie's driving lessons, a redneck Christmas, and John Luke's wedding - in one spec-quack-ular collection!